and will arrive back on shelves later this month. also be available in stores on July 27 for $2.99. 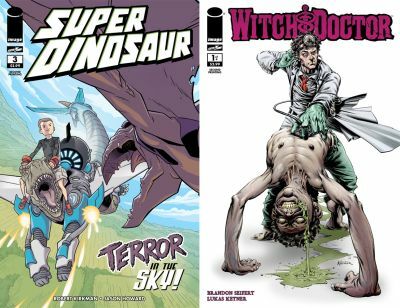 For more information about the awesomeness that is SUPER DINOSAUR, visit http://www.superdinosaur.com/, and for more information about the gruesome practices and procedures of WITCH DOCTOR, visit http://www.witchdoctorcomic.com/.